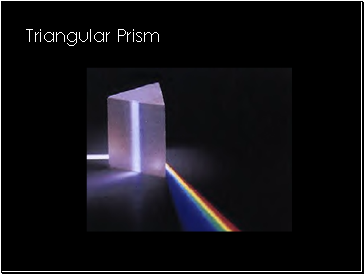 •His method showed that sunlight is composed of a mixture of all the colors of the rainbow. •This selection of colors is called a spectrum: red, orange, yellow, green, blue, and violet. 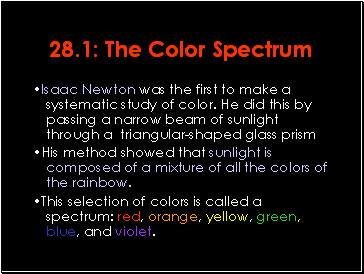 •True colors- Newton showed that colors in the spectrum were a property of white light. All the colors added together make white. •Black is not considered a true color, but it is the absence of light. 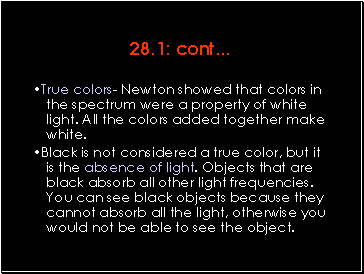 Objects that are black absorb all other light frequencies. You can see black objects because they cannot absorb all the light, otherwise you would not be able to see the object. Molecules are made up of atoms. Atoms contain protons and neutrons. 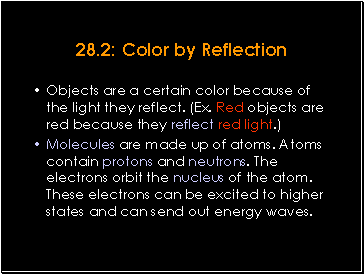 The electrons orbit the nucleus of the atom. These electrons can be excited to higher states and can send out energy waves. 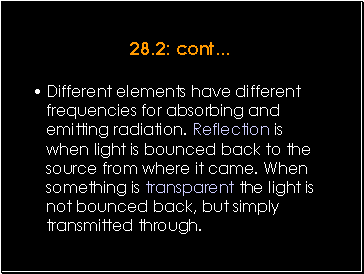 Different elements have different frequencies for absorbing and emitting radiation. Reflection is when light is bounced back to the source from where it came. When something is transparent the light is not bounced back, but simply transmitted through. An object can reflect only light of the frequencies present in the illuminating light. 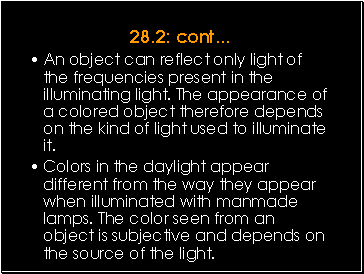 The appearance of a colored object therefore depends on the kind of light used to illuminate it. Colors in the daylight appear different from the way they appear when illuminated with manmade lamps. 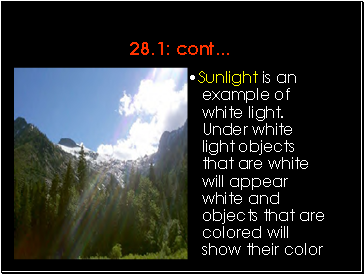 The color seen from an object is subjective and depends on the source of the light. 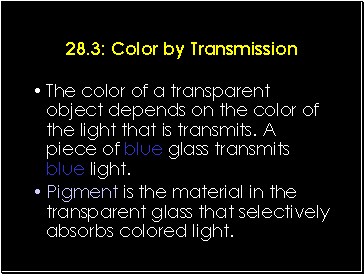 The color of a transparent object depends on the color of the light that is transmits. A piece of blue glass transmits blue light.